Archie is nearly 4 months old and getting more and more interactive by the day, both with the people around him and with his toys. He has the motor skills to bat and pull and the co-ordination to reach what he wants. 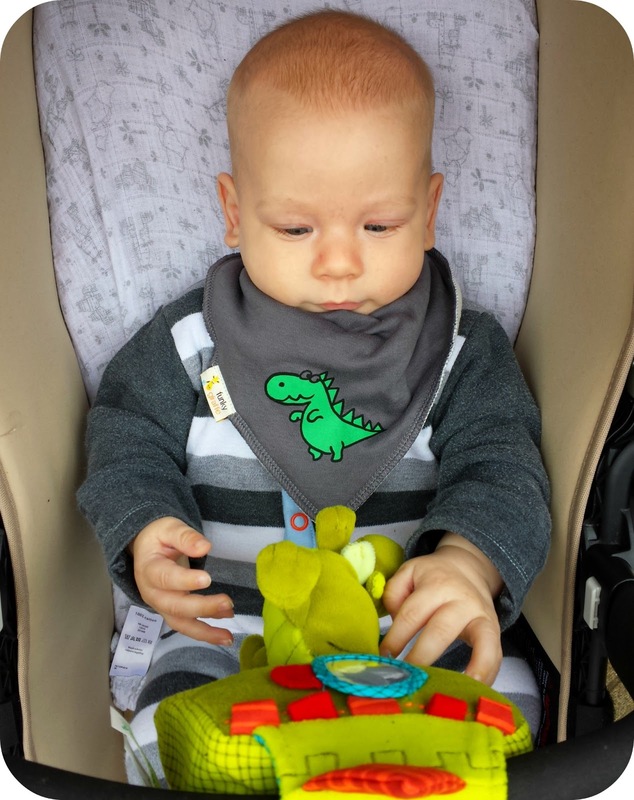 The Toadstool sent us some toys from their gorgeous Lilliputiens range to try out and Archie is really enjoying playing with them. his initial refusal to be anywhere but firmly attached to me, Archie is now happy to go in his pram and we have started hanging toys to keep him entertained. We attached the Lilliputiens musical dragon castle to the bar on the Bugaboo Donkey and he loved trying to pull the dragon and batting away at it Dylan worked out how to make it play music quite soon and the gentle lullaby is perfect for persuading Archie that it is time for a nap. 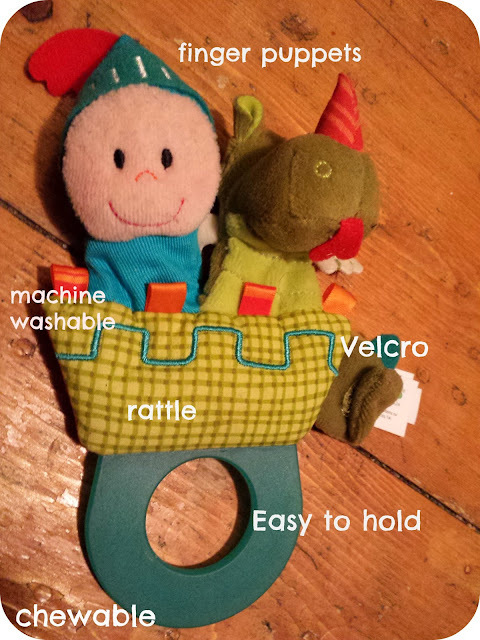 The teething puppet rattle has also entertained both boys. Dylan loves anything that is meant for his brother and has been trying to use the puppets to entertain Archie although he has more fun taking his fingers in and out of the holes. Archie likes chewing it but seems totally entranced when I sing my silly made up songs using the puppets as props. He tracks their movements and tries to reach out for them. I love this range of toys and the characters and they are prefect for encouraging a child's imagination. I love the fact that the rattle is machine washable as it is often drenched in dribble and I love how it helped the boys to interact with each other. At £11.50 I think this is a reasonable price for something which is effectively 3 toys in one - puppets, a teether and a sensory rattle. 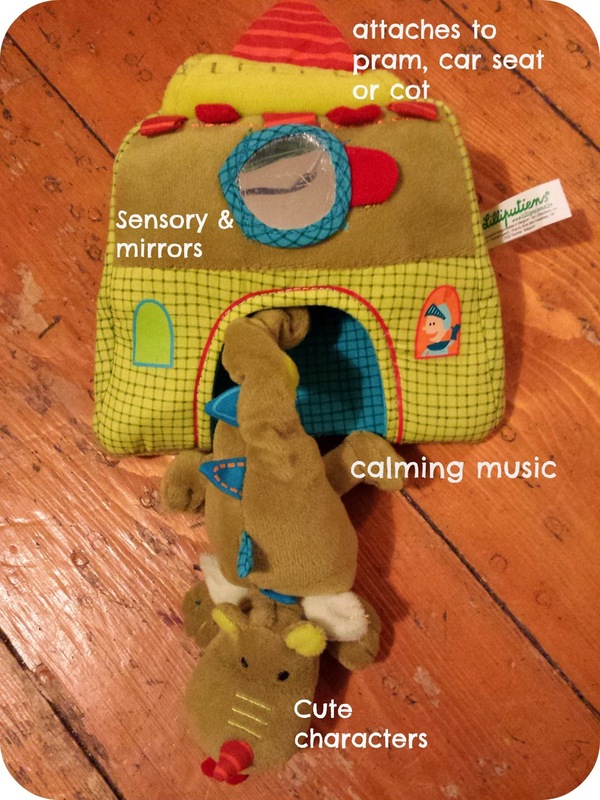 The musical castle retails at £21.20 which is more than I would usually pay for a pram toy but it has really entertained both boys and the soothing lullabies are fantastic for Archie so it is getting a lot of use. Disclaimer: We were provided with these toys free of charge for the purpose of this review but all thoughts and opinions are completely my own.